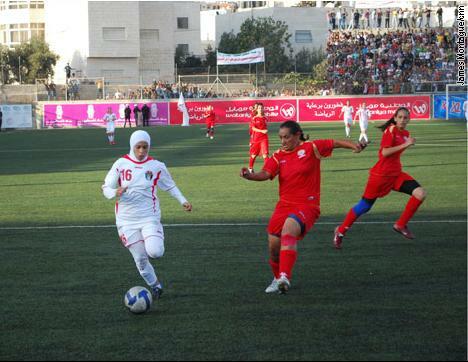 October 26, 2009–The Palestinian women’s national team played Jordan in their first ever home match. The game was played at Faisal Husseini International Stadium in the West Bank. Depending on the country, women in Muslim parts of the world have varying experiences; they face different obstacles in trying to participate in sports. Even so, these female athletes have a few things in common. They all must try to navigate the complexity of their identities. Individually, girls and women make decisions for themselves based on their values, obligations, expectations, affinity to sport and whatever else it is that makes them who they are. Below, we’ll explore some of the ways girls and women in Muslim countries might experience sport. Keep in mind that there is no single “female Muslim” experience. O and to be ready for war. These mandates are given to all Muslims, which would include women. However, there are also some examples where the Quran explicitly invokes women. One such instance of this is when the Prophet Mohammed races against his wife. Additionally, in the Quran women engage in warfare and other military expeditions. Research also indicates that some women in a study felt that there was a positive obligation to participate in sport—not just that it was permitted. In light of the traditional Islamic practices and the lack of resources (leagues and/or facilities) which accommodate them, many Muslim girls and women must decide what it is they’re comfortable with, based on their values, obligations, expectations, affinity to sport and other facets of their identities. It’s a personal struggle for women to reconcile being Muslim, being a woman, and being an athlete. Yuka Nakamura studied the experiences of Muslim women who were born in or immigrated to Canada. Obviously, Canada is not a Muslim country. However, we can still learn something about the way Muslim women come to practice their faith while identifying as athletes. Of the twelve subjects in her study, Nakamura found that modesty was the more important issue and posed the greatest barrier. Even so, differences in observances existed. Eleven of the twelve said they’d cover their legs when exercising publically, even if they were in a women-only space; eight said that they wore their hijab during sports even though all of them believed they were supposed to. Here, we’ll see how different women observe the practice of separating themselves from men during exercise and sports. The women and girls that Kay categorized as traditionalists believes that to participate in sports women need to be out of sight of men. Some of the subjects of Walseth and Fasting’s research show a more nuanced interpretation. They believed that women only need to be out of sight of men if they’re going to be wearing sports attire which shows inappropriate amounts of skin. Some women who were stricter in their observance (they wore the krimar and/or niqab) thought that women, even dressed in their appropriate garments, should refrain from activities which might be sexually exciting to men. In Catherine Palmer’s research of Muslim refugees, she explains how deciding on a team uniform for the refugees’ soccer team illustrated the complexities of individuals having different practices. Some girls on the team chose to wear typical shorts and tee-shirts while others preferred to play wearing long sleeved shirts and track pants under their uniforms. With regard to headscarves, some girls abandoned their headscarves all together, some opted for a bandana instead of their hijab, others wore the krimar, and some would take off their niqab when they were only with girls. The team’s goal recalled a situation in which girls would remove their hijab to head the ball and then put it back on and resume playing. The team had to overcome issues surrounding “sexualized movements” when the girls learned how to chest the ball. Consistent throughout the literature was the notion that men and women should not compete together. Even this, however, was not unanimous. Zahra, one of the girls in Nakamura’s research, practiced with and competed against boys in karate. She felt comfortable with this because she was never making “skin on skin” contact. Walseth and Fasting also noted that one participant in their study played soccer with her brothers. Due to the lack of necessary infrastructure, not only do women not play casually but they also don’t have the opportunity to compete at a high level. To remedy this, Fa’zeh Hashemi founded the Islamic Countries Sports Solidarity Congress for Women. They convened for the first time in Tehran in 1991 and in 1993 Tehran hosted the first Women’s Solidarity Games. The games are like a Muslim Olympics for women. To allow the athletes to wear modern sports attire during the games, only other women are allowed into the stadiums (with the exception of the opening and closing ceremonies). During the medal ceremonies, pictures and press conferences the athletes wore hijabs. The Solidarity Games now welcome non-Muslim countries to send delegates from their Muslim communities. Started in May 2008, Sertaç Sehlikoglu Karakas writes a blog called Muslim Women in Sports: The Role of Sport in Resisting, Accommodating and in Remaking Muslim Women. A member of Women Living Under Muslim Laws (a non-profit organization), she is a graduate student in anthropology at the University of Toronto. She writes the blog with her mentor, Concordia University Professor Homa Hoodfar. She updates the blog with current events in the world of Muslim women’s sports. It is a great way to stay up to date or to look through archives of relevant stories. Walseth, Kristin, and Kari Fasting, “Islam’s View on Physical Activity and Sport: Egyptian Women Interpreting Islam,” International Review for the Sociology of Sport 38,1 (2003): 45-60, SPORTDiscus, Web, 7 October 2009, <http://irs.sagepub.com>, 45, 48, 56. Nakamura, Yuka, “Beyond the Hijab: Female Muslims and Physical Activity,” Women in Sport & Physical Activity 11,2 (2002): 21-, ProQuest , Web, 7 October 2009, <http://proquest.umi.com>. De Knop, Paul, et al, “Implications of Islam on Muslim Girls’ Sport Participation in Western Europe. Literature Review and Policy Recommendations for Sport Promotion,” Sport, Education and Society 1, 2 (1996): 147-164, SPORTDiscus, Web, 155-156. Kay, Tess, “Daughters of Islam: Family Influences on Muslim Young Women’s Participation in Sport,” International Review for the Sociology of Sport 41, 3-4 (2006): 357-373. SPORTDiscus. Web. 7 October, 2009, <http://irs.sagepub.com>, 358, 365. Nakamura; Walseth and Fasting, 52. Collins and Kay, 133; Palmer, 30; De Knop et al, 155; Kay, 359; Walseth and Fasting, 48, 52, 54. Collins, 133; Palmer, 27, 30, 31; Kay, 359; Nakamura; De Knop et al 155. Collins, 133; Palmer, 30-31; De Knop et al, 149, 153, 155; Kay, 359, 366, 365; Okey, 56. Palmer, 27; De Knop et al, 155; Collins, 133. De Knop et al, 156. Okey, 133; Palmer, 27, 31; De Knop et al, 155-156; Walseth and Fasting, 54. Bell, Daniel, and Mickey Friedman, “Islamic Countries’ Women’s Sports Solidarity Council and Games,” International Encyclopedia of Women and Sports, Editors Karen Christensen, Allen Guttmann, and Gertrud Pfister, Volume 2, New York: Macmillan Reference USA, 2001, Print, 593. Akbar, Arifa. “Muslim Women in a Football League of Their Own.” The Independent. 15 September 2005. Web. 10 December 2009. <http://www.independent.co.uk/news/uk/this-britain/muslim-women-in-a-football-league-of-their-own-506889.html>. How to cite this article: Risa Isard, edited and updated by Maggie Lin and Patricia Spears, “Muslim Women in Sport” Soccer Politics Pages,http://sites.duke.edu/wcwp (accessed on (date)). hi, I’m a brazilian student of journalism in Mackenzie University and I would like to make some questions about sports in Islam for an article. Thank you! Nice Article, I’ve seen a lot of women who play football wearing hijab and long sleeves, it’s good to be religious, When i was searching about hijab sport dress so i got this blog, which cover hijab styles of sports.